Well, @TheWelshWookie and I were hoping to run in the inaugural Rock ‘n’ Roll Liverpool half marathon next weekend. But, plans have changed, so we’ll have to pass on it this year. The aim is to break the world record for the longest continuous relay around the coast of Britain. Did someone say record attempt? We’re in! 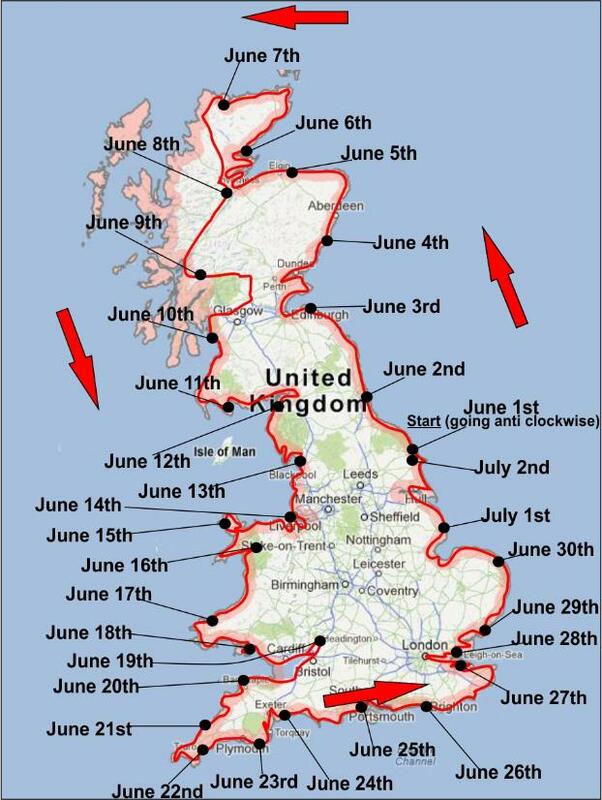 The British coast has been split into 594 stages, and the run is done continuously, 24 hours a day, during June and July 2014. @TheWelshWookie and I will be running stage 138, from Duror to Strath of Appin Primary School, which is at the very north of Argyll and Bute. Our stage handover is at 18:19, and our stage is 12.5K long. There are still a few gaps along the way, including immediately before us, so I have no idea how we’re going to get the baton! Any suggestions for how to manage the logistics? Have you signed up? Very cool idea for a run! One question – why is the North West corner skipped? I think it may be lack of proper roads! Lol! Sounds like an fun challenge! good luck! That relay looks awesome! If I was closer, I would definately be in…after training a bit more obviously! NOW, have you two considered parking the car at the finish, and then unloading your tandem bike from the back to ride to the start line, then offer the people that hand you the baton, the tandem to ride back to your car, and them promise them youll give them a ride to their car, when you get back to yours? Just food for thought. :) Cant wait to see how it goes! Aww, wish I had a tandem now! Great idea! I can’t believe it’s already almost here! I feel like you first mentioned this so long ago. It sounds like it’s going to be a great time. It seems to have snuck up on us! And this is how #ATWRBR2014 came to be created. Course is looking nice and (reasonably) flat, just hope the weather will be better when we run than when we recce’d!